Learn how to make a nifty origami tissue paper holder for your handbag! These are quick and easy to make. You can use tissues or toilet paper for these! If using toilet roll, the paper can be pulled out from the opening in a neat way. These are very handy to keep in your bag especially if you want to save money and not buy little packets of tissues in plastic. You will need 1 sheet of square paper for this. To fit most toilet roll, use paper that is at least 20 x 20 cm, ideally use paper that is a bit larger, up to 30 x 30 cm. It's nice to use paper with a different design on the back and front. You can also use fabric for this one, iron the fabric after each step, and even add a little push clasp on the back. 1. Start with your paper with the color you'd like the flaps to be - facing up. Fold the paper in half diagonally both ways and unfold. 2. Fold the top and bottom corners to the central point. 3. Keeping the flaps in place, fold the top and bottom edges to the central point. 4. Unfold all of that back to the start. You will have seven horizontal creases. 5. Fold the top corner down, using the third crease from the top. The point should reach the second crease from the bottom. 6. Next, fold the corner back up to the top edge, leaving a small 2-3mm gap. 7. Fold the bottom of that section up to meet the central horizontal crease, and then fold up again. 8. Repeat the same steps on the lower section. To make it easier, you can rotate the paper so that the point is at the top again. 9. Next you can work out some rough thirds here. These will be mountain folds. 10. Flip the model over to the other side and fold the sides in. Depending on the size of your tissues you will need to adjust these folds. 11. You can insert one end into the other. If your fans don't reach, just use some sticky tape or glue, after you have put your tissues inside. 12. Flip the model over and this is the finished origami tissue holder. 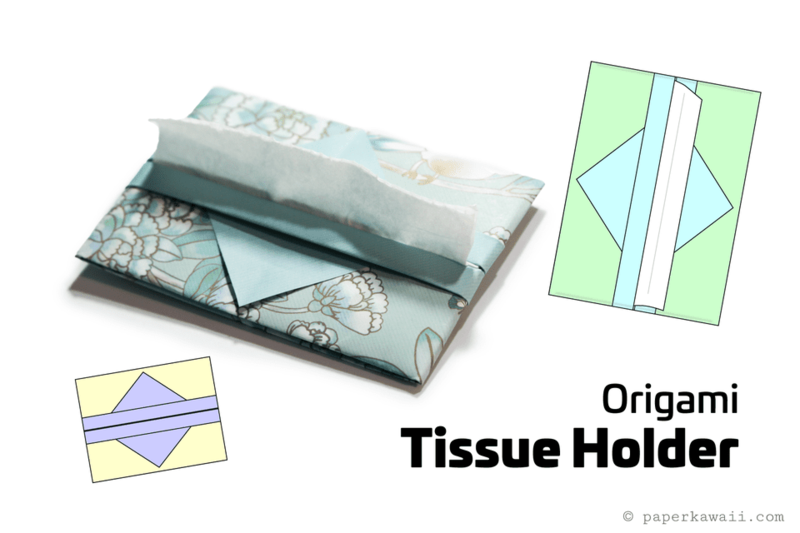 Go to the next page to find out how to fold tissue to put inside. 13. You can use toilet paper for this. Unroll some tissue from the roll. Using your origami tissue holder as a guide, roll up some of the tissue into a neat roll. The height of the new roll should be a bit smaller than the holder. 14. You should now have a little roll of tissue. 15. Unfold the tissue holder and put the roll inside, with the loose end coming out of the opening. 16. Re-fold the holder, you may need to re-fold the holder a bit looser on the edges to fit the paper. If you used bigger paper (30 x 30 cm maybe) you can use the tissue that you get from tissue dispensing machines. If you enjoyed this tutorial, why not check out this easy DIY origami fan or the origami money envelope letter fold!